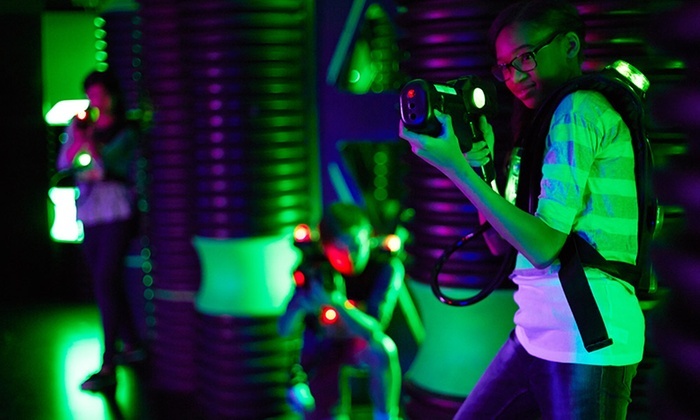 One among the key attractions at Epic Play Zone is our laser tag arena. Gear up and get ready for an action packed adventure in our Laser tag arena spanning more than 4000 SQ foot laser tag arena, players will experience heart-pounding excitement as they compete against other players by navigating through maze of glowing LED lit panels, foggy, music filled adventure where the goal is to score as many points as possible while avoid being hit. The up tempo game can be played in teams or as individual players, while our scoring system keeping track of the all the action. 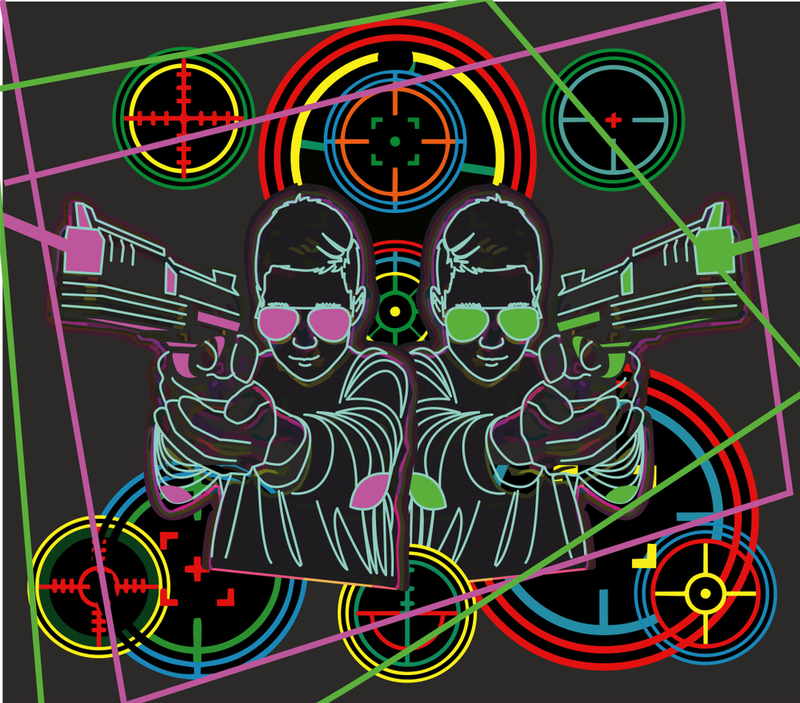 Your gear includes the latest in laser vest and phaser technology. Some think that 15 minutes isn’t that long, we constantly warn first time players to be prepared to sweat. 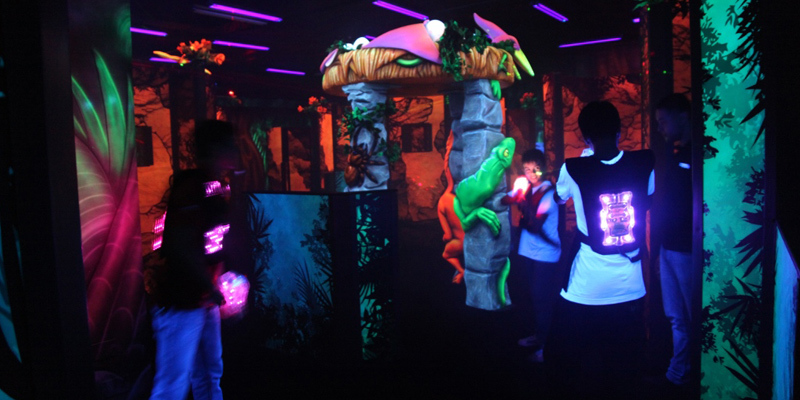 Laser tag is unconventional way to get your daily exercise session in while having fun! This fast pace strategic game keeps your feet moving, it’s great for all to participate. Just to give you an idea of what ages are playing, we have seen everything from the young brave child to the veteran of 50 years old enjoy playing. 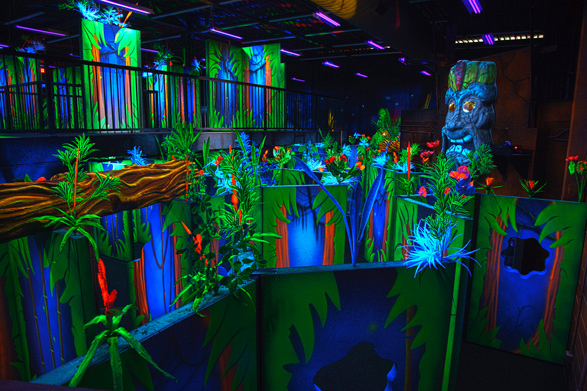 At Epic Play Zone, we offer wide variations of Laser Tag games. The team with the highest number of players that are of the same team color at the end of the game wins! This game has some interesting and strategic aspects. It’s played very similar to Team Play with a few differences. When a player of one team is deactivated by a member of opposing team/ color, upon reactivation, he is now on that team and his vest team/colors will change as well. For example: green team member is deactivated by a red team member, upon reactivation, his vest colors will glow red, he then becomes a member of the red team. The Home Bases will only deactivate and be deactivated by players of a different team/color. For example: Red Home Base will not deactivate red team members, but it will deactivate all other teams, and it cannot be deactivated by red team members but it can be deactivated by all other teams. The Sentry Pods on the other hand act in a unique manner. They switch sides to the team that deactivates it. For example if a Sentry Pod starts out as blue, it will deactivate all teams except for blue team members, but if it is deactivated by a red team member, upon reactivation, it then becomes like a red team base until it gets tagged again by an opposing team color. The game ends when all players are on the same team/color, or if the time has run out then the team with the highest tem/color wins. Mortals stay away from the Vampires (Red Players) before they turn you into a Vampire. The Vampire(s) 1, 2, 3, 4 or 5 – is to be activated first, vest color will be red. Mortal players, when loaded, will be green (We call these players the Mortals). Once a Mortal has been deactivated by a Vampire (Set LIVES option) the Mortal becomes a Vampire and assists other Vampires to turn all other Mortals into Vampires. The display on the phaser shows how many Mortal Lives are remaining every time you get deactivated. Mortals cannot deactivate each other. Vampires cannot deactivate other Vampires. There can be up to five Vampires to start the game. If a penalty is set to 3, 5, or 10 SECONDS, this will allow the Mortals to deactivate a Vampire and gives the Mortal time to get away. The Home Bases and Sentry Pods all start Red (Vampires). When they detect a Mortal they will fire at them and take away a life if deactivated. If a Mortal deactivates a target, the target will then turn green. Once the target has turned Green the Mortal may gain a life back by allowing the target to deactivate the Mortal Player (Only when the target is flashing green). Only up to the maximum number of Mortal Lives programmed at the beginning of the game. Vampires win, if all Mortals have been turned into Vampires before the time runs out. Mortals win, if they outnumber the Vampires at the end of the game. The object of the game is for teams to defend their bases and accumulate as many points as possible, by tagging opposing colored players and the other teams Base Stations. Sentry Pods – Will attack all players that come within 3 meters of the target. Players also have the ability to tag Sentry Pods. Targets in the arena are not designed to give players a lot of points. The targets are in the arena to prevent players from standing in one area for too long. Start Points – (Set the start points higher for younger kids so they don’t get a zero score at the end of their game). The object of the game is for the players to not get tagged by the ‘IT’ or ‘IT’s’ and get the highest score. A minimum of 3 players or more recommended. After loading all the players with a game the system randomly picks a player to be ‘IT’ (Can program up to 5 ‘IT’ Shooters). The IT’s vest color will glow RED and all other players who are not ‘IT’ targets glow GREEN. All players including the ‘IT’s’, start off with (START POINTS) points . When a player is ‘IT’ his score is being deducted by X points every second that he is ‘IT’. When a player is not ‘IT’ his score gains by X points per second that he is not ‘IT’. When a player is not ‘IT’ and tags an ‘IT’ he then becomes ‘IT’. If the ‘IT’ is unable to tag a non ‘IT’ player for X seconds, the ‘IT’ is eliminated from the game and the player with the lowest score, then becomes ‘IT’ and the game carries on until the time runs out. When a player is not ‘IT’ and tags another non ‘IT’ player he takes away _________ points from that player. ‘IT’ seconds can be programmed for Infinite, 5, 10, 15, 20, 30 ‘IT’ seconds. To be the last man standing. The first half of the game is to gain as many lives as possible by tagging all opposing players. All target colors for the first half of the game will glow RED. When the game reaches the halfway point, all vests will change colors (GREEN) and the targets will power up to let the players know that all player tags at this point will be taking away Lives. The last half of the game is to take away as many lives as possible by tagging all opposing players. When a player reaches less than three lives his vest will change from GREEN to ORANGE. This is to let all other players know that he is on the brink of being Eliminated. The player with the highest number of lives remaining wins. The object of the game is for teams to defend their bases and accumulate as many points as possible, by tagging opposing colored players and team Base Stations. The Team Bases will randomly switch between the Team Colors. Once a base has switched colors it immediately start firing without detecting opposing players. Sentry Pods – Will attack all players that come within 3 meters of the target. Tagging Sentry Pods. Good team strategy with proper offense and a good defense, will ensure victory and keep them coming back for more. Start Points – (Set the start points higher for younger kids so they don’t get a zero score at the end of there game). The object of the game is too accumulate as many points as possible, by deactivating as many players as you can for the duration of the game. You have the ability to have up to four different groups (colors) playing at once. This is great for group/birthday parties, because it allows the groups to see and play amongst their friends, but at the same time you can continue to add walk ins to the game at anytime. Sentry Pods & Team Bases – Will act the same and attack all players no matter what color they are.